Sania Mirza teamed up with Canadian Daniel Nestor to outplay Akgul Amanmuradova of Uzbekistan and Ashley Fisher of Australia 6-3, 6-1 in the first round of the mixed doubles. 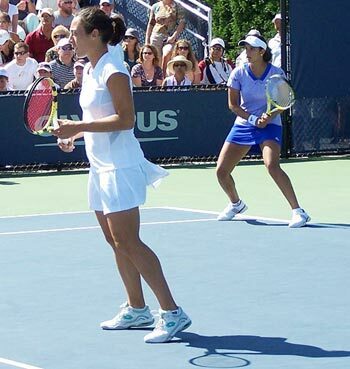 Sania, who couldn't partner Mahesh Bhupathi as she wasn't certain about playing in the tournament, made a good start to her makeshift partnership with Nestor. Meanwhile, Bhupathi has teamed up with America's Liezel Huber. Second seeds Leander Paes and Cara Black of Zimbabwe overcame a fighting unseeded pair of Swiss Patty Schnyder and South Africa's Wesley Moodie to advance to the next round of the mixed doubles. The Indo-Zimbawean pair, the defending champions, tamed the unseeded opponents 6-4, 3-6, 11-9 in the first round. Meanwhile, third seeds Mahesh Bhupathi and Mark Knowles cruised to the men's doubles second round after scoring a comfortable 6-3, 6-4 win over American James Cerretani and Lovro Zovko of Croatia. His Grand Slam debut has given Somdev Devvarman the belief that he belongs to the big league and the rising tennis star now wants to win a Davis Cup World Group berth for India. Somdev, who became the first Indian in eight years to qualify for a Grand Slam at the US Open, lost his second round match in four sets to Phillip Kohlschreiber but not without showing his class. After playing in his maiden Grand Slam, Somdev has already started thinking about the next assignment -- India's away play-off tie against South Africa. "Davis Cup is the next target. It's a big tie and I would like to win it for India," Somdev said. Somdev beat higher ranked players in the qualfiers to enter the main draw and fought his heart out in the second round but the couldn't get past against the experience of Kohlschreiber. "It has been a great experience for me. I think I played well this last week and half. I am taking a lot of positives from the tournament. "More belief that I belong with the big boys and that I am on the right path. 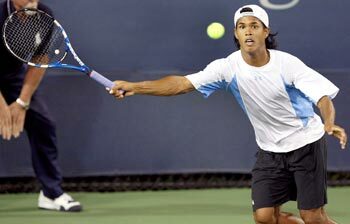 Just need to keep working hard on my game," Somdev said. Meanwhile, Sania and her Italian partner Francesca Schiavone, seeded 14th, survived a scare from unseeded Ekaterina Dzehalevich of Belarus and Czech Renata Voracova before recording a 5-7, 7-5, 6-1 win to advance to the women's doubles second round. The Sania - Schiavone duo will now meet the pair of Gisela Dulko of Argentina and Shahar Peer of Israel in the second round. On Wednesday, Sania's challenge in the singles had ended with a 6-0, 6-0 drubbing at the hands of 10th seed Flavia Pennetta of Italy. Met A R Rahman? Share your experience!